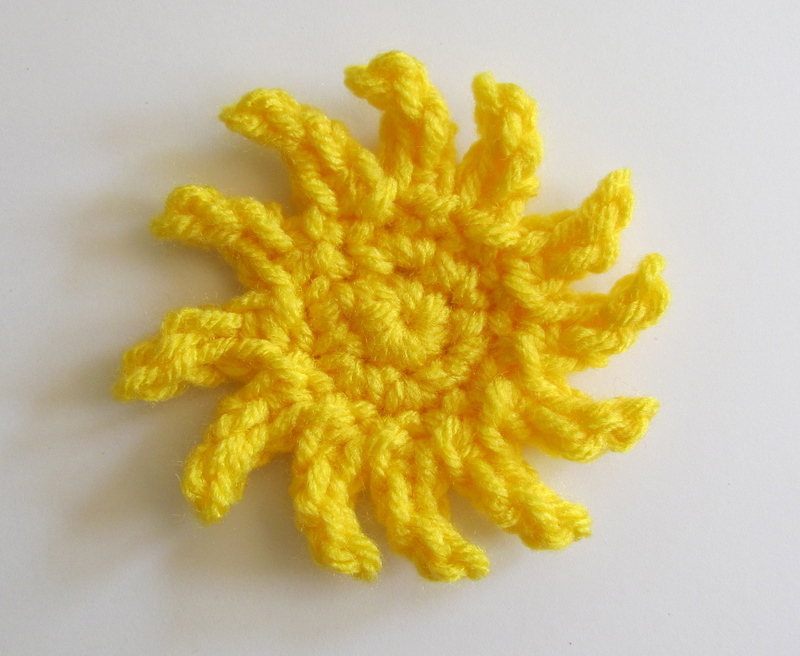 I contemplated adding a little smiley face to this sun appliqué, but wasn’t sure. Would that have looked cute, or tacky? It works up super quick & takes only a few minutes to make. Materials Used: Below are the materials I used, but you can really use any yarn and hook you want. Round 1: 6sc in magic ring, do not slip stitch. Round 2: 2sc in each sc around, do not slip stitch. Round 3: * sl st in next sc, ch4, sl st in 2nd ch from hook, sc in each of next 2 sl sts, repeat from * around, slip stitch in 1st sl st. I like it just like it is. But it might look cute with a little face–not sure!! Try it and see what you think. Thanks for the pattern! Love this! I think it looks great without a face, but would also look cute with one. Thanks for sharing! Excellent pattern!! So easy so cute!! !